This Coconut Shrimp recipe makes a great appetizer or party food, and it’s easier to make than you might think! Disclosure: This post is brought to you on behalf of OXO and NFI Shrimp Council. This post contains affiliate links. My husband and I have a serious addiction to coconut shrimp. If we are eating shrimp out in a restaurant, chances are, we’ll pick the coconut shrimp. But, strangely enough, I had never made coconut shrimp at home. And it’s even more strange when you consider that coconut shrimp is fairly simple to prepare and only takes a handful of ingredients. Well, when I was invited to participate in the #ShrimpShowdown, sponsored by OXO and NFI Shrimp Council, I didn’t have to think twice about what I would make. The Eastern Seafood Company sent me some beautiful wild-caught, extra-large shrimp that I were just begging to be coconut shrimp. 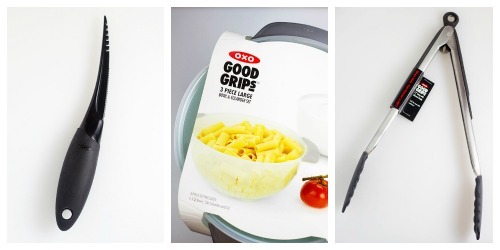 OXO sent me some tools too — a few of their best products to help me in the creation of my recipe. I was sent their Shrimp Cleaner, 3 Piece Bowl and Colander Set, the 12″ Tongs with Silicone Heads, Flexible Kitchen & Herb Snips, Wooden Lemon Reamer, and Silicone Steamer. Now, let’s get started! The first step is defrosting your shrimp. I did this in the OXO 3 Piece Bowl and Colander Set by running the shrimp under cold water. 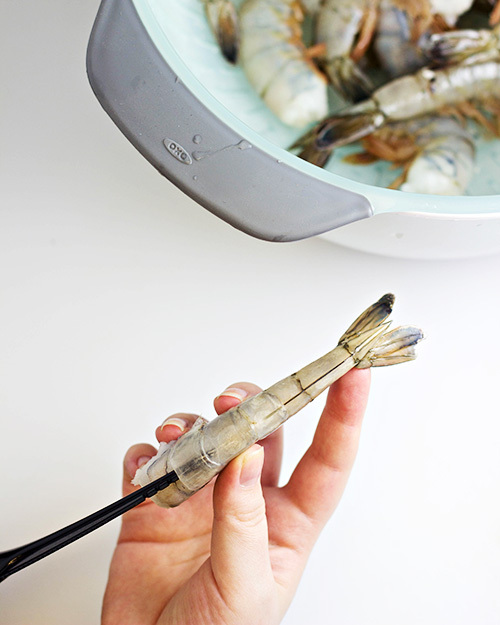 The bowl is also helpful in holding the shrimp after or before de-veining them, particularly if you want to prep them in advance because it comes with a lid. To be honest, I didn’t really feel like I needed another bowl, but now that I have this one, I’ve already used it several times. 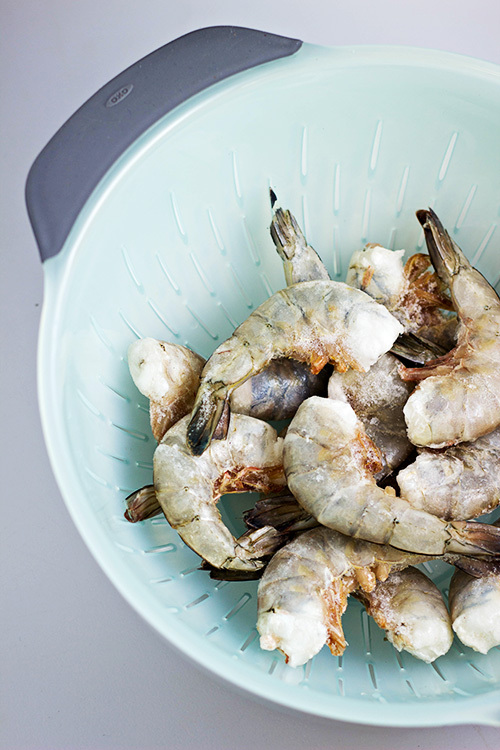 For de-veining the shrimp, you are going to love OXO Shrimp Cleaner. It was a HUGE time saver. Until it was sent to me, I didn’t now that such a tool even existed, but now that I have it, I’ve not only used it for the coconut shrimp, but also in my Shrimp and Asapargus Stir Fry. 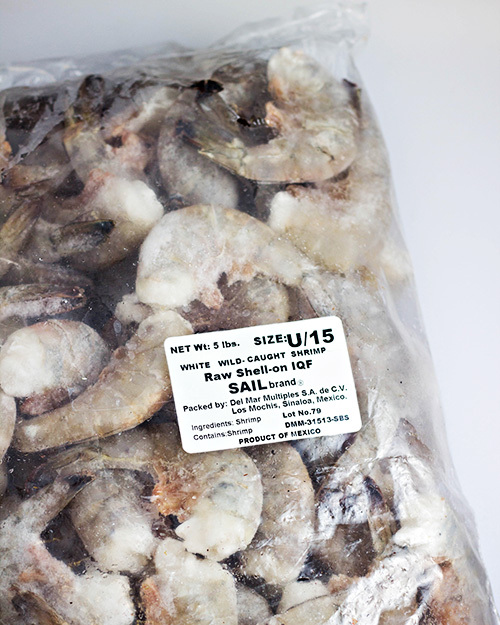 It makes peeling and de-veining shrimp so easy…you won’t want to go back to de-veining shrimp without it. After peeling and de-veining the shrimp, you’ll be ready coat them. First, the shrimp is dipped in beaten egg. Then, it goes for a dip in coconut flour, and then back into the egg just before it’s final coating that consists of a mixture of both coconut and panko bread crumbs. After coating, you’ll fry the shrimp in hot oil, turning them over as necessary so both sides cook evenly. 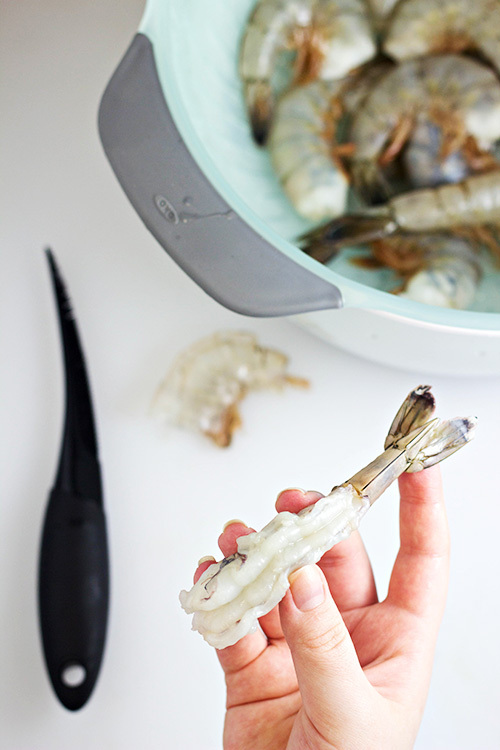 I used the OXO 12″ Tongs with Silicone Heads to turn them and remove from the oil — they are heat resistant up to 600 degrees F, so not only could they handle the heat, but the silicone make them nice and gentle on the shrimp. Oh, and guess who’s in love with these tongs? David! That man has SO many grilling tools (you know, the kinds specifically built for grilling) and he’s been snagging to use these outside for our grilled meals. I refuse to let him keep them outside with the others though. See how easy these are? Fry them all up and you’ll have delicious shrimp for an appetizer or dinner. I created a Orange-Habanero Sauce, which gave these a bit of a kick when dipping, but you can use anything you like for dipping…or go dip-free, if you prefer. Place eggs in a shallow bowl and beat. In another shallow bowl, place coconut flour, salt and pepper together; mix to combine. Place coconut flakes and breadcrumbs in a 3rd shallow bowl and mix to combine. While holding one shrimp by the tail, dust shrimp with coconut flour, and then coat with egg mixture, allowing excess egg to fall off. 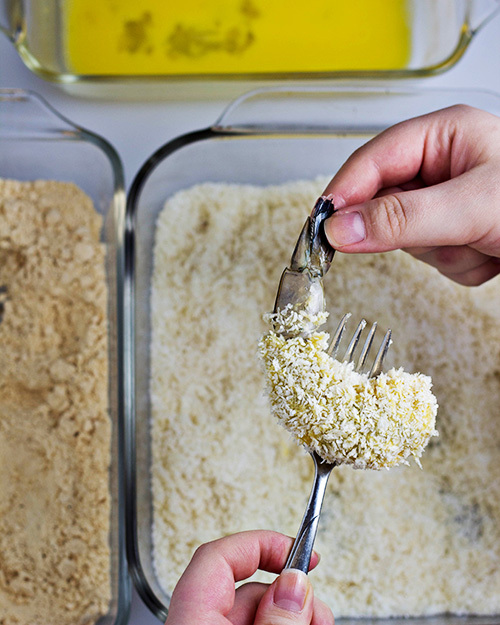 Finally, coat with the panko/coconut mixture, pressing gently to adhere mixture to shrimp. Place on a plate and repeat with remaining shrimp. Heat 1″ of oil over medium high heat until it reaches 350 degrees F. Add a few shrimp to the hot oil and cook for about 2 minutes or so, turning them over halfway through to fry each side. 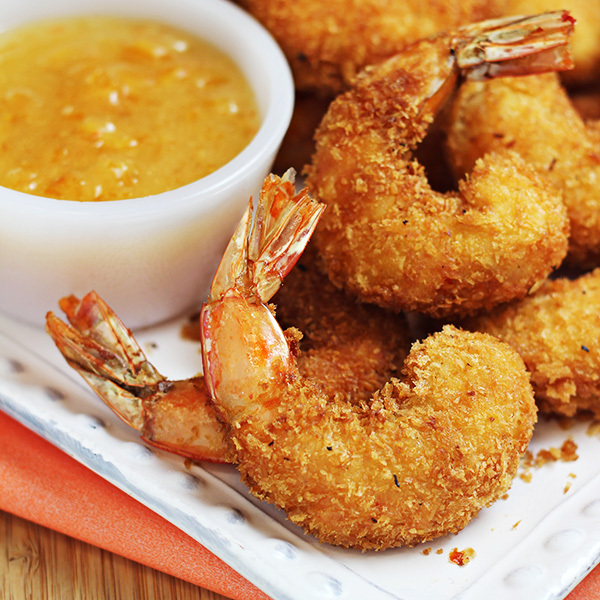 Remove from hot oil when when golden brown and place shrimp on a paper towel lined plate. 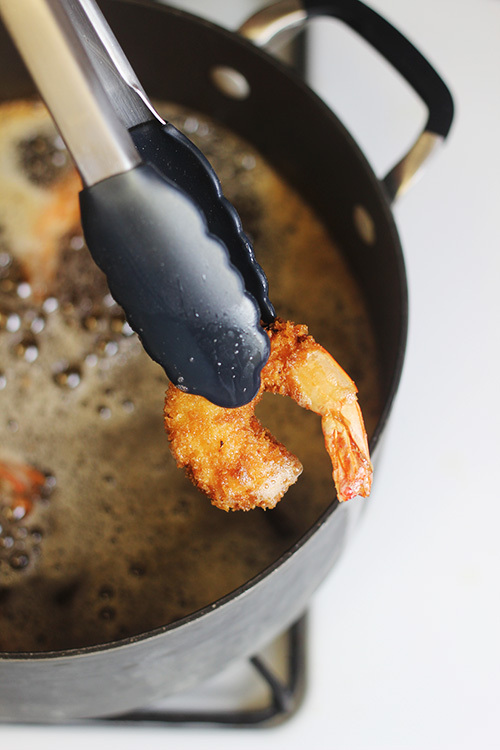 Continue frying remaining shrimp until all are cooked. Cajun Shrimp & Grits by So How’s It Taste? This looks so good AND easy! I need to get one of those shrimp cleaners. Did’t even know those existed. I had to laugh; I clicked over to your post thinking “I Love coconut shrimp but have never thought to make it myself” and that was pretty much YOUR first line. This sounds amazing and I can’t wait to try it. Pinned. That’s a beautiful picture and makes me crave some coconut shrimp now! I’d love for you to share over at a new party called Let’s Party https://themarkandjanshow.com/2017/12/27/lets-party-1/ … look forward to seeing you there! We always do shrimp for New Years. Thanks for the amazing recipe. These babies look delicious! Thanks for linking up with us at Share the Wealth Sunday! Coconut Shrimp, one of my favorites! Thanks so much for sharing your awesome recipe with us at Full Plate Thursday! Hope you are having a wonderful week and hope to see you soon! These look delicious. I’m having shrimp for New Year. I’m going to try your recipe. Thanks for sharing on Sunday’s Best. I have never been brave enough to experiment a lot with shrimp at home – not sure why. You make this look easy so I’ll give it a try since my family loves shrimp! I’ve pinned this to my personal recipe board in addition to our group board. Thanks for sharing at Over the Moon. We look forward to seeing what you share with us in the new year. I love Coconut Shrimp it is one of my favorites. Hope you are having a great week and thanks so much for sharing your awesome talent with Full Plate Thursday. I haven’t had coconut shrimp in ages but I remember the first time I had them, I couldn’t stop eating them (I later learned they were particularly good examples which was part of it!). These look great, I must have a go myself. I LOVE Coconut Shrimp! 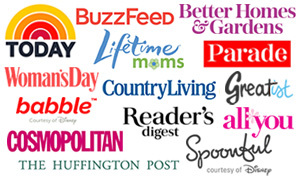 Thank you so much for sharing on the Wonderful Wednesday Blog Hop! I’m definitely pinning your recipe on our board!! You did such a nice job on this post! I”v never tried making coconut shrimp, but boy I see I need to now! These looks wonderful! This is one of my favorite ways to eat shrimp! Love the photos and great recipe! 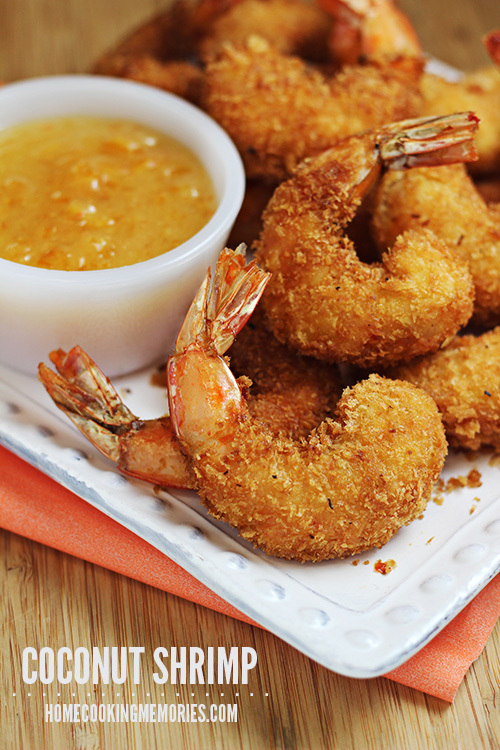 Oh my gosh, I love coconut shrimp…far too much! The thing is, I haven’t made or even eaten it in years. Why!? Thank you so much for the reminder, I wish I could reach in and “share” yours Brandie ;). I’d gladly share with you, Heather! It’s the same way for me, loving coconut shrimp, but never made it until now. I have a feeling my kids will be requesting it quite often. Thanks for coming by and commenting! My husband loves coconut shrimp from a particular restauarnt but I can’t bring myself to pay that much for 6 shrimp. I’m definitely trying this recipe! 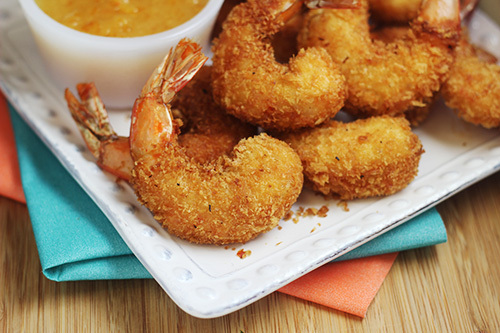 I absolutely LOVE coconut shrimp, but have never tried to make it at home. You make it seem so easy! I guess it is with these awesome tools! This looks so good, I want to try to make this. The kids love shrimp so I think this would go over well. 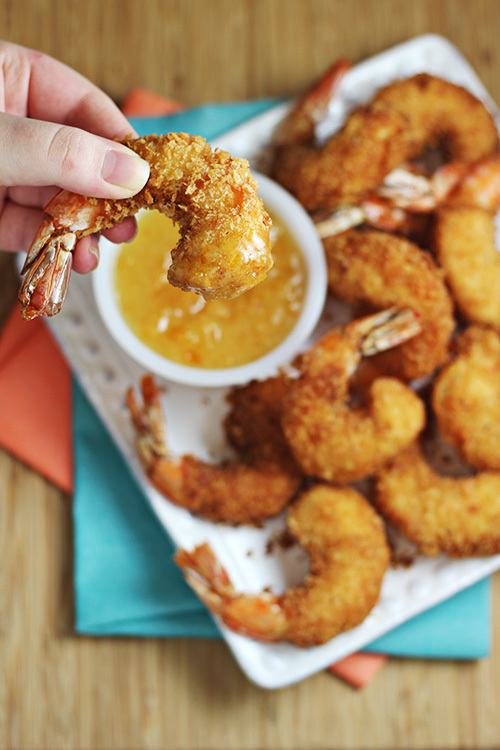 I love coconut shrimp but I have never made them…they look so easy! Thanks for sharing! Coconut shrimp is my favorite variety of shrimp!! I love coconut shrimp. I’ve never made it myself but yours looks so good I will have to try! i need the shrimp cleaner. who knew that existed? i don’t eat shrimp but my family loves it so i make it often. and i HATE cleaning shrimp! Sorry I can’t be any more eloquent than this but…mmmmmmmmmmmm coconut shrimp!!! I love anything shrimp! These look wonderful. I am new here but looking forward to your newsletter. Wow, breaded and fried to perfection! Your coconut shrimp looks amazing, Brandie!!! Love, love, love coconut shrimp! Yours look just perfect!